Skypro provides cutting-edge and innovative products that care for its users, through absolute attention to every detail. An immeasurable passion originates great stylish shoes, made with the best calf leather, alarm-free, temperature control, and slip-resistance technologies. This unique blend of know-how and technology allows Skypro to deliver exceptional products that ensure comfort, performance, and long-term well being for all frequent flyers – every day, everywhere – to always walk and fly in first class. Ordered this shoe and Walking Cradles Heidi at same time. Both were comfortable but I felt the SkyPro was slightly wider in the heel and would possibly begin to slip after some wear. Returned the SkyPro. Unfortunately, Its a half size too small. Super comfortable. Good flex in the sole; they aren't overly rigid. I feel like I could dance in them! This shoe wasn't as comfortable as I had hoped, particularly in light of the price. I was disappointed that this shoe wasn't more comfortable. It is a nice looking pump, but not as comfortable as others. This shoe definitely runs small, I recommend going a half size up. 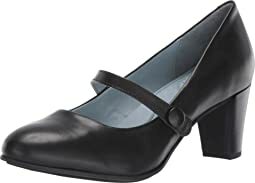 I normally wear a size 7.5 and these shoes had my toes scrunched and curled, super uncomfortable. Love the look and quality. But way too narrow and tight across the top of the foot. to be called Medium. Got to go back. Comfortable and well made. 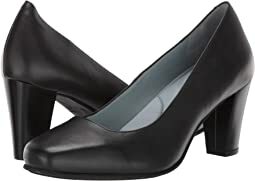 A classy, versatile black pump. 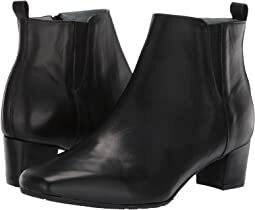 Maybe just a *shade* loose at the heel but not enough to go up a size—I wore these to a party where I walked and stood all night and didn’t have a problem, but if it does become one a heel pad would probably do the trick. I ordered these for work and I could tell from the moment I tried them on there is no way I could last thru the day, let alone even an hour! The toe area was extremely narrow and I have a very average foot. It was squeezing my toes together. They started out with such promise. I bought them for an all day interview for a Flight Attendant position. By the end of the day, they were killing my toes. 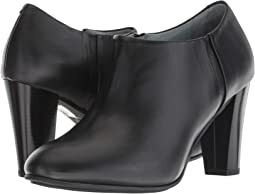 I have a narrow heel and thought these would work but my foot would slide forward. There is not much cushioning for an all day wearing. 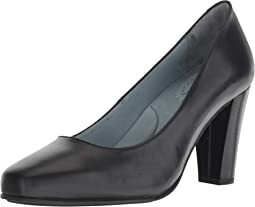 They would be fine for a couple of hours but would not make the cut for me as a working Flight Attendant pair of shoes. 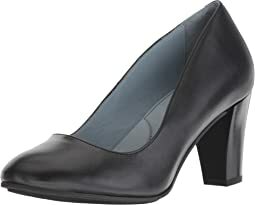 Fit was true to size, except that it does not work for people with a narrow heel. Wish I could return them. Not very comfortable on wearing for the first time. I only wore it once to work through airport terminal and inflight and my feet were sore in the toe box. Wish I could return it! Wish there was a little more arch support & my toes are hitting the top of the toe box (but I think that’s just how I walk). Really love the style & are pretty comfortable for high heels. I haven’t worn heels this tall for awhile! The heels are more narrow in real life (less chunky) than they are in the photo. I wish this shoe had fit. 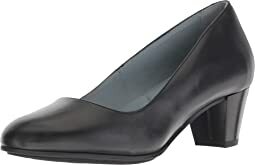 Would be a good alternative to a ballet flat for work. Could be worn with a thin sock. I normally wear 8 medium, but this was too narrow in the toe box. Would probably fit if you have narrow feet. Love this shoe! Took a size 6 instead of my usual 61/2. I really wanted to love these shoes. 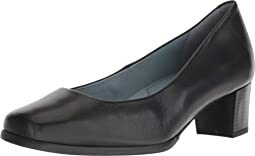 I ordered the Naturalizer Whitney to compare and these feel a little more supportive. I wore them to an all a day interview and by the end of the day my toes were squished. 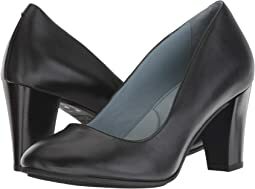 I have a narrow heel and they are medium width. The arch support in them was good but overall I couldn't see wearing these as a Flight Attendant walking through the terminals. Wish I could return them. I'll keep searching! I have been trying to replace my work shoes for a year. THESE are the winner! I love the quality and cute design, as well as, how comfortable they wear. It's obvious these are a quality shoe created for those of us who need to look presentable while being on our feet for long periods of time. Great shoe!!! The leather is nice and soft, and, for me, the style is fine for work when wearing pants. My heels slipped out when walking so I had to return them. These are beautiful shoes but they seem to run about one half size large so I am sending them back. They look very nice on my feet and are very well made. I wish they fit better. This style was a bit dowdy unfortunately. 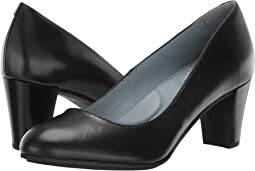 Very nice looking pumps for work, funerals and weddings. I wear a size 5 and found that it is 1 size too big. I am waiting for a size 4 when it comes in stock. 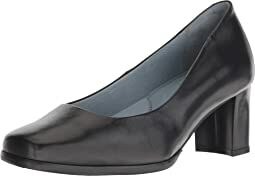 The square toe look is what I find attractive about the Mary Myers II, but being that it over 3 inch high, there should be more padding at the ball of the feet for all day comfort. These are the reasons I took off 1 star for Overall rating, and 1 star for Comfort.